Radio City’s RJ Salil and RJ Archana along with the pothole man Dadarao Bhilorey, who has filled almost 570 potholes, and pothole killers Irfan Machchivala and Mushtaq Ansari were in full gusto and filled the potholes at Veera Desai area, Andheri west. 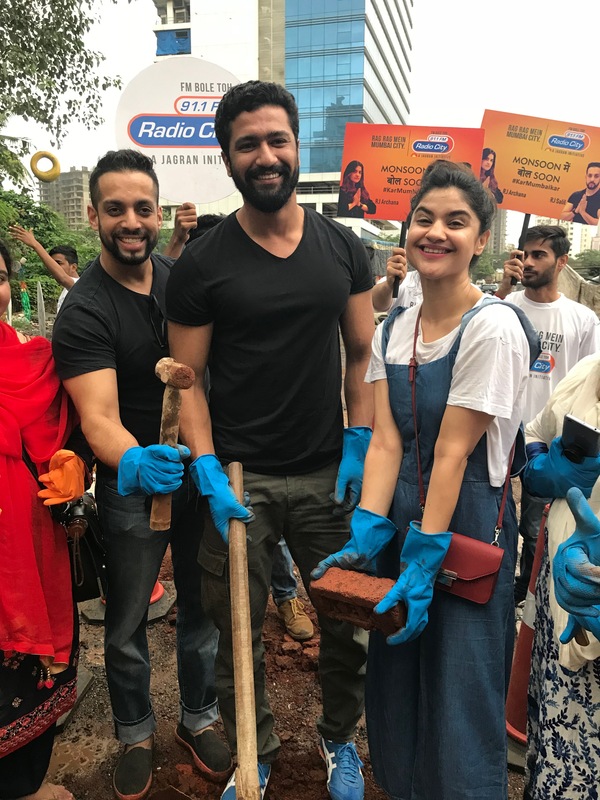 Bollywood actor, Vicky Kaushal extended his support and filled some potholes in the area. Radio City’s most loved show Kasa Kai Mumbai, with RJ Salil and RJ Archana was broadcasted LIVE from the venue. The activity received an overwhelming response from the Cityzens and people came down to extend their support in full swing. The initiative, which urged citizens to ‘Monsoon mein bol soon’, kick started on-ground in the last week of July and have successfully resolved people’s problems in areas like Kandivali, Thane, Malad, Vashi Andheri and more. Radio City urges Mumbaikar’s to dial in on 66969191 or reach out to Radio City’s RJ’s on social media to flag off all problems pertinent to their locality.